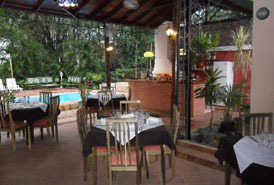 The chill-out bar and grill La Campana looks a lot like an upmarket farm (Finca) than anything else. This is a swish ranchón beside a nice pool. Depending on the night, you may be able to combine dinner with a concert. Kelvis Ochoa, December Bueno and David Torrens have all played poolside recently. On these nights, starting around 11pm, the place gets packed to the rafters with a trendy young crowd. Sunday lunch is more a family time. The menu, which has received mixed reviews, is extensive and includes tapas (ceviche, carpaccio, papas bravas, gazpacho and so on) and sushi, pizzas and pastas (gnocchi are a speciality), Chateaubriand steak, fish and paella. Everything except traditional Cuban-Creole fare.